with evidence of the painful truth. unforgettable memories in my mind. having converted to Islam in 1915.
grandfather's past in his old homeland. at another restaurant, and not theirs. Van, all in greater numbers than the Armenians who had come to pray. woman from Diyarbakir accepted to act as the interpreter between them. man was sincerely interested in her story and shared her feelings. under the ground, of valuables left by the victims. Armenian quarter where, in 1915, the siege and resistance took place. lose your perception of reality. Armenians in the sign welcoming the guests to the island? share the Armenian visitors' feelings. gesture by the Turkish government. Maybe we should all send a thank you note(?) to that clown for shining the light on the Gem of Armenian Architecture and History. Not even all the gold in Fort Knox could have bought so much free advertisement. This is just a beginning, they “invited” the world media, which will follow up for a long time. Even if the A word may not appear at the site, look how Freely they are using the Armenian name of the City, where as a short time ago the A word was considered a blasphemy , just as even now alleging that one’s mother is Armenian is tantamount to mean one is “born out of wedlock”. Also note how below the writer suggests “what if Armenians were to pray at mosque”, I had alluded to that in a previous post, but of course I did not mean it literally as Christian Armenian prayer is not a matter for ridicule, as they made a mockery of the Muslim prayer. Also note, surveying the pictures and videos of that farcical comedic charade and tell us how many women you see. Another subject. Mutlu Tombekci, an analyst for the Turkey-based Vatan newspaper, severely criticized Devlet Bahçeli, the leader of the Nationalist Movement Party (MHP), who, together with his supporters, performed a namaz at Ani church in protest at the liturgy in Surb Khach church on Akhtamar Island. “1. The permission for a liturgy at the Sümela Monastery in Trabzon was granted in December 2009, eight months before the 2010 liturgy. “The permission for annual liturgies on Akhtamar Island was granted on March 25, 2010, seven months before the September 19 liturgy. “As regards the unsanctioned namaz at Ani, I knew about it two days before. They got permission within 12 hours and performed namaz the following day. I did not understand the reason for their haste as well. Days run out? Only Bahçeli and his mob knew about the namaz just three days before? “2. There is a great difference between the namaz at Ani and the liturgy in Surb Khach on Akhtamar Island. “Ani Church is not a Muslim sacred place. Did Armenians hold a liturgy at a mosque that had been turned into a church? It is an Armenian church. Armenians built this church 1,000 years ago, and it served as an office of the patriarchate. They wished to hold a liturgy at a renovated church and had been waiting for it for three years. They got a permission and, as normal people, informed everybody of that. Everybody made their plans accordingly, and we went to observe the liturgy. One more thing: in what place of your country you cannot perform namaz? How many Muslims have to this day known about Ani? I tell you. None! “3. Why was I to act like a child? Why Ani? Why in an Armenian city? Why a church turned into a mosque? Even to this day no sign in Ani contains the word ‘Armenian’, but it is another topic. But Bahçeli’s gang knew it was Armenian. “The namaz performed by the Turkish nationalists did not look sincere at all. It followed the ‘eye for eye, tooth for tooth’ principle. It was full of hate and smacked of revenge. “So what you say. If you perform namaz not in Ani, but in the Voyvoda mosque, which was turned into a museum of Greek folk art in Athens. You will say: we have permission, let us go. You should know, I would be happy to come with you. We will perform namaz in the Greek capital and have kebab at an Armenian restaurant thereby giving them an answer. “Come on, turn to the Athens Mayor for permission to perform namaz. Kebab at my expense, and do not be afraid – I will not treat you pork,” Mutlu Tömbekçi writes in her article. The article evoked a wide response throughout Turkey. A number of journalists were highly critical of it in their articles. And the lies go flying!!! The liars club is working overtime. In another two days it will be the one year anniversary of that farcical fiasco of the signing of the proctocols. The liars club headquarters may be in ankara , but it seems it has subsidiaries in Yerevan, While they are assuring the world that the talks are ongoing Mr. Nalbandian is refuting. Who is the bigger liar? Look at these two stories. Technical problems? That the entire structure had to be reconstructed to accommodate the ten ton cross? That it will be installed before April 24, that it will take another 1.5 months? There were many stories between the above Sept. 3 and the below Oct. 2. Note below that it took a three year technical problems" was resolved in a few hours? several (technical? )hours to install. 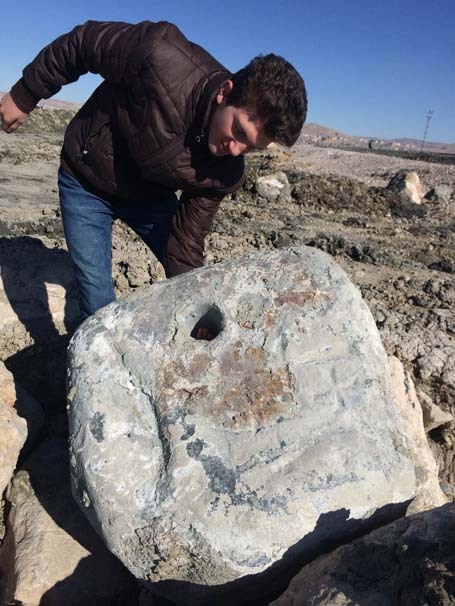 Head of the Religious Council of the Armenian Patriarchate of Constantinople Abbot Tatul Anushyan consecrated the cross on the dome of Surb Khach Church (Holy Cross) on Akhtamar Island, Turkish Hurriyet daily reports. Edited by Arpa, 08 October 2010 - 08:39 AM. the Hurriyet Daily News reports. during an annual Divine Liturgy on Sept. 8.
celebrated in 2010 for the first time in 95 years. due to the ongoing peace process. VAN. – Ninety-eight years after the Armenian Genocide, the fourth Divine Liturgy was served Sunday in Surp Khach (Holy Cross) Armenian Church at Akhtamar Island on Turkey’s Lake Van. The event was held without any incidents and in a warm atmosphere (PHOTOS). This year’s mass stood out by an active participation by Armenians from Armenia, the Armenian News-NEWS.am reporter informs from Van. But numerous Armenians from Turkey likewise attended the divine service. The Holy Mass was offered by Archbishop Aram Ateshyan, the Armenian Deputy Patriarch of Constantinople, who informed that a baptism ceremony will be held at the church after 100 years. And following the divine service, the members of an Istanbul family, which had returned to their Armenian roots, and five persons from Armenia, including 8-year-old Van, were baptized. Armenia’s well-known political and public figures, the US Consul in Turkey’s Adana, the mayors of Van and Gevas, an MP representing Van, famous Turkish actor and director Kadir Inanir, and many other well-known officials and individuals also were on hand at the Holy Mass. The Turkish police were taking security measures at Akhtamar Island and the harbors toward the island. The police boats and helicopters were on duty around Lake Van, and rescue squads and ambulance staff were on duty on the island. The security officers on Akhtamar Island claimed that about 3,000 people were on the island at the time of the divine service, and more people visited the island throughout the day. – Oversight by low-level Turkish officials who did not realize the P.R. value of publicizing the change. – Reluctance of high-ranking officials to draw attention to the change, fearing that they would appear ridiculous taking credit for something so obvious that should have been done long time ago. – Concerns by Turkish officials that making public the revised text would impress the outside world, while triggering criticism at home for catering to Armenians. – Preoccupation of newly-elected Turkish leaders with other urgent matters. They may yet make an announcement at a later date. Please Mr. Sassounian, it is not AKHtamar/ԱԽԹԱՄԱՐ, it is AGHtamat ԱՂԹԱՄԱՐ as in Haght yev Amar/Amur. The KH in the name is from Toumanians pun, word play, barakhagh AKH-TAMAR, just as in Yerevan we dont know what the Latin X is. Is it KH or GH as XAXOX? good article on Aghtamar in a way. But instituting these niceties as described by the author does not provide justice for the genocide. A nation was criminally destroyed. The genocide also has effectively endangered the future of Armenians as a people. The only proper way to right the wrong is for the return of those lands to the Armenian people. The acknowledgement of the genocide by Turkey and their supporters (the US and Israel) is just a first step. It can't stand on its own, its really meaningless on its own. The return of those lands is the only just final outcome of that Acknowledgment. The turks will never do it on their own and no one will force them to do it, but that is the only proper true way to address the genocide. We really don't need an apology from anyone, Armenians need the homeland back, as outlined in the Treaty of Sevres. This is the key to the future of the Armenian nation. A tiny landlocked nation effectively owned and controlled by the Russians and local mafia elements is not a viable future for the Armenians still living there nor for the slowly assimilating Armenians living abroad. 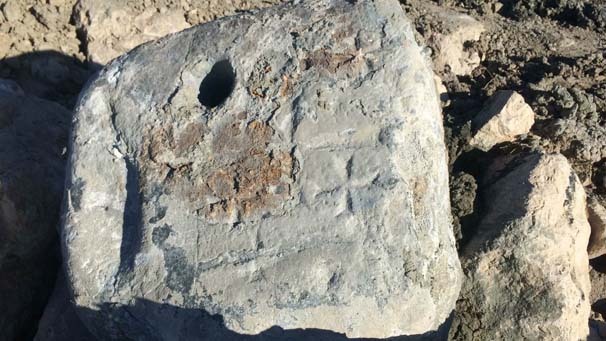 Cross-stones have been recovered from the bottom of Lake Van, Milliyet reports. 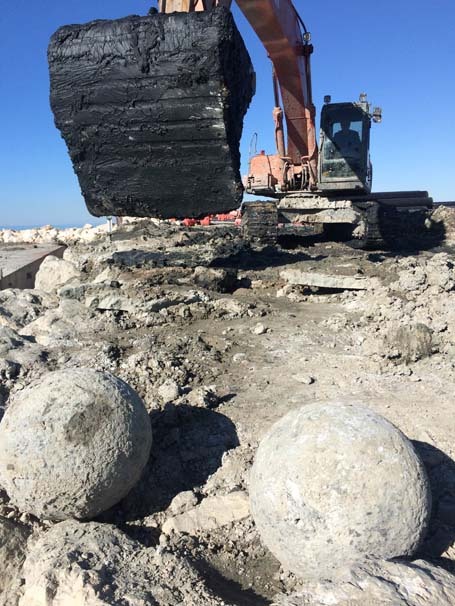 The FIVA company, which cleans the bottom of the lake, has found two stones with a cross inscribes and two stone blocks and wooden pieces. The company has kept relevant bodies informed, but there has been no response so far. 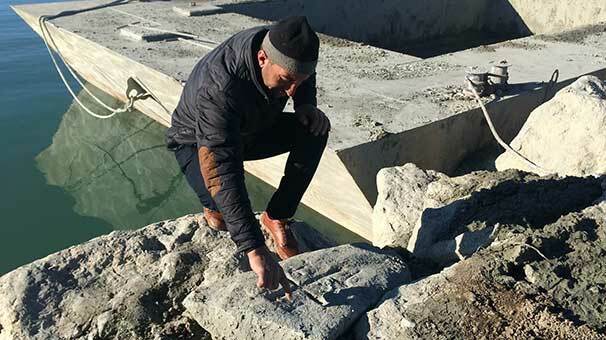 “I think there are more stones like this in the bottom of the lake,” company official Ayhan Disari has said. Even the dead are insulted in Turkey!!!!!!!!! Why? Because they are Armenians!!!!!!! Garo Paylan, Istanbul Armenian MP of the opposition pro-Kurdish People’s Democratic Party (HDP) of Turkey, reflected on the press reports regarding the building of a toilet and a changing room for a public beach at Lake Van, and on an Armenian cemetery. In a statement that is posted on the HDP website, Paylan noted that the said area in Edremit (Artamed) district of Van Province is a historical site where there are Urartian monuments. Also, he recalled that 100 years ago, this place was Khorgom village that was densely populated with Armenians. 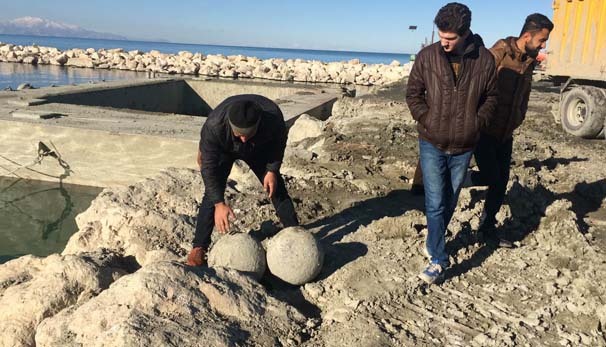 Garo Paylan condemned the Turkish authorities’ decision to build the aforesaid public beach’s toilet and a changing room on an Armenian cemetery, and demanded that measures be taken to remedy the situation. I hope the Turks do the honourable thing and put the bell at it's proper place at the church. TEHRAN—Iranian officials have said that they will return a 629-year-old bell, which belonged to an Armenian church in Van, to the Holy Cross Church in Akhtamar. The bell was given to St. Mary’s Armenian Church in July of 1377 and was taken to Iran under unknowns circumstances. It has been on display at the Anthropology museum in the north-western city of Urumieh, reported AmedToday.org news agency. “We have begun a policy of returning all historical monuments and artifacts in Iran to their countries of origin in compliance with all necessary legal procedures,” said Mirhadi Kareseyyed-Romiani, Vice-President of the Iran’s Cultural Heritage, Handicrafts and Tourism Authority. The Iranian official said this policy aims to demonstrate to the world the true nature of Iran as friendly country that prioritizes good neighborly relations and respect for humanity and history. Akdamar Church, a medieval Armenian church, in Turkey's eastern Van province draws the interest of foreign and domestic visitors. The church, located on Akdamar Island in Lake Van, was built between 915 and 921 A.D. by architect Bishop Manuel, under the supervision of Gagik I Ardzruni, an Armenian king. It was accepted in the UNESCO Tentative List of World Heritage on April 13, 2015. The church, which was opened as a monument museum in 2007, has been hosting annual international religious ceremonies organized by the Armenian Patriarchate of Istanbul once a year since 2010. Muzaffer Aktug, Van provincial director of culture and tourism, told Anadolu Agency that the church deserved to be included in the permanent list of UNESCO. "Around 83,000 people visited the island in the first seven months of this year," Aktug said.